In general, I don't make a habit of watching food TV. If I see something on Food TV, it is most often because someone else is already watching and something particular catches my attention as I pass through the room. Such was the case a little over a year ago when I happened to see Martha Stewart doing a show on grains. Because I am always looking for new ways to work with grains I paused to take a look. 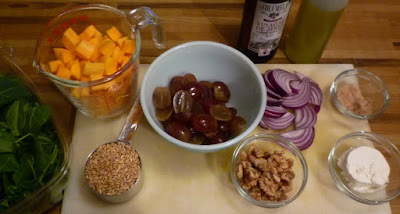 When she began to prepare a farro salad that featured roasted grapes, I was hooked and I stopped to watch. It looked so good I made a mental note to make the salad...and then, as happens all too often, it slipped my mind. I'm not sure what it was that made me think of this salad again, but I finally got around to trying it...or I guess I should say, my adaptation of it...over the holidays. It really was delicious. I wanted to share the recipe then...but just ran out of time. I admit that the best time to make this salad is in the late fall when the big, juicy, California red grapes are at their peak. But since good quality grapes are available year round, I decided to go ahead and post it now. If you're lucky, you can still find California grapes in the stores.... Furthermore, if you are trying to get your eating back under control after a holiday season of sugary excess, this salad, with its abundance of grains, greens, fruits and vegetables....and its appealing textures and flavors...would be a great addition to the plan. I said I adapted the salad, but I really didn't change it too much. The original recipe called for roasting the grapes for 45 minutes. Since I wanted them to still have a bit of body and texture, I reduced that by quite a bit. I also wanted my salad to be substantial enough to serve as a meatless entrée, so I added some roasted butternut squash to the mix. This turned out to be a particularly nice addition...lending not only more substance, but also complimenting the sweet character of the grapes. As a final touch, I topped my version with some toasted nuts...pecans on one occasion, and walnuts on another...for added richness and crunch. Since this is the beginning of the year, and some may have found themselves here while trying to fulfill a resolution to cook more real food, I want to take a moment to point out where you can learn more about the basic elements in this recipe. 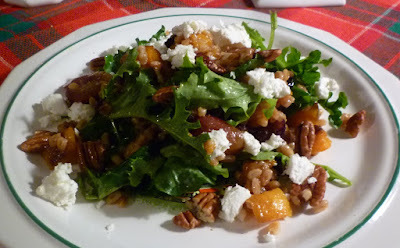 If you have never cooked with farro before, I wrote about my introduction to the delicious world of farro a couple of years ago. In a later post, I wrote about the most common cooking methods. For this recipe, you will be cooking the farro just as you would pasta...in boiling salted water. If you don't think you like whole grains, farro is a perfect place to start...it is every bit as friendly and easy to love as pasta. If you are new to roasting vegetables...or have struggled to get your roasted vegetables just right...I wrote a detailed post several years ago on how to roast vegetables. After reading that post, the method used in this recipe—roasting the butternut squash and red onions together first...and then adding the grapes towards the end—will make sense. Doing it this way insures that the butternut squash and red onions (which take longer to cook than the grapes) will be tender and well-caramelized and that the grapes will still have substance and juice. Don't worry if the red onions get a little crispy...this will add tender crunch and subtle sweetness. If some of the onions threaten to burn though, either remove the ones that are getting too dark with a pair of tongs, or tuck them under a grape...or a chunk of squash...where they will be protected from the heat of the oven. I hope you enjoy this salad as much as I do. If you like grains...or want to like grains...you will find a lot of recipes to experiment with here on my blog. You can click on a specific grain that interests you in the sidebar at the right...or go to the recipes page and scroll down to the grains section. I hope that you will find something that appeals to you...but if not, check back occasionally. I love grains and towards the end of February will be teaching an all new class devoted entirely to the subject. One or two of those recipes are certain to wind up here. Spread the nuts on a small baking sheet and toast in a preheated 350° oven until golden and fragrant...about 5 minutes. Transfer to a plate to cool. When cool enough to handle, break the nuts into coarse pieces, drizzle with olive oil and sprinkle with salt. Set aside. Increase the oven temperature to 425°. In a large bowl, toss the squash and onions with enough olive oil to coat and season with salt, pepper and brown sugar. Spread in a snug single layer on a large rimmed baking sheet and roast until tender and caramelized, stirring once and being careful not to tear the squash—about 20 to 30 minutes (see note). Toss the grapes with a tablespoon of olive oil, season with salt and pepper and scatter over the caramelized squash and onions. Return the pan to the oven and continue to roast, stirring once, until the grapes are just tender...another 10 to 20 minutes or so. Set aside. While the vegetables and grapes roast, bring a pot of salted water to a boil. 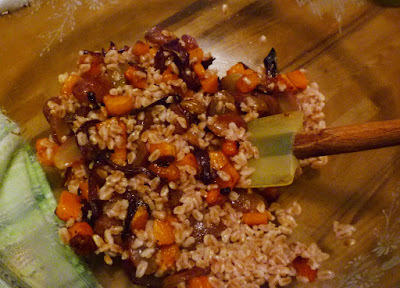 Add the farro and simmer until tender (it should still have texture)...about 25 minutes. Drain well. Transfer to a large wide bowl. Add the vegetables and sherry vinegar and toss to combine. Because the salad is to be served slightly warm, or at room temperature, the farro and vegetables need to cool a bit. This is best accomplished by spreading it out in the bowl a bit (as opposed to mounding it in the center). You can also spread the mixture out on the baking sheet the vegetables were roasted on (return everything to the bowl to finish the salad). 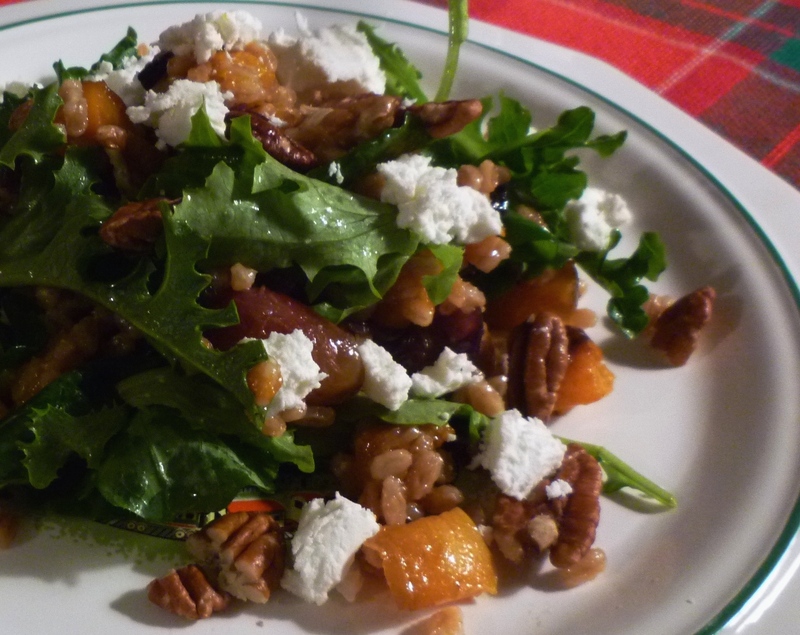 When the farro has cooled to the point you want, add the baby kale and toss to combine. Taste and correct the seasoning with vinegar, salt & pepper. If the salad seems dry, drizzle with a bit of olive oil. 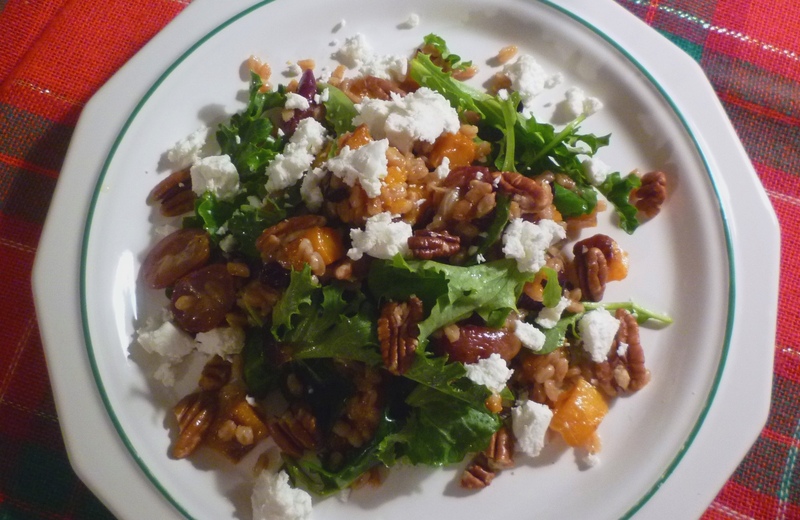 Transfer to a platter or individual plates and scatter the goat cheese and nuts over all and serve. Serves 4 as an entrée....6 to 8 as a side. Note: The length of time you roast the squash before adding the grapes will depend on the firmness of the grapes. Softer, riper grapes will only need about 10 minutes in the oven...so they will be added when the squash and onions have been in the oven about 30 minutes (a little more or less, depending on your oven...you want them to be tender and beginning to nicely caramelize). If your grapes are very firm, they might take as long as 20 minutes. The squash and onions should be just beginning to caramelize when you add these firmer grapes. Basically the total roasting time should be about 40 minutes...adding the grapes at the optimal point so they are just tender when the squash and onions are well caramelized.